Free Recording Link for “Brain-Based Presenting” Courtesy of InSync | Training from the BACK of the Room! InSync Training’s Resources page not only archives their complimentary webinars, but also offers infographics, podcasts, white papers, videos, and other resources about 21st century learning, presenting, and training – whether in virtual or face-to-face learning environments. I encourage you to explore their “Modern Learning Resource Libraries” under the Resources tab. Membership in their learning community is free (you have to join or sign in to view the Resources – you can unsubscribe anytime you wish). 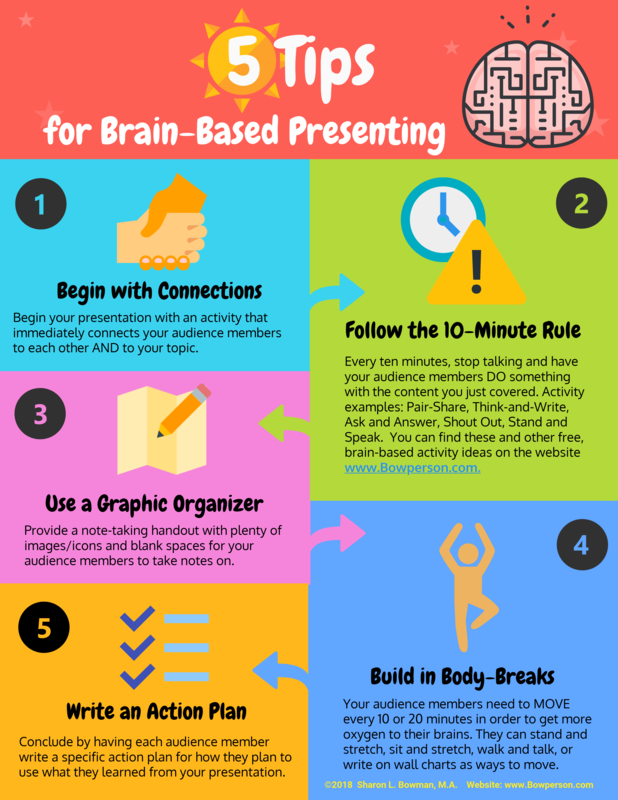 Here is the complimentary recording of “Brain-Based Presenting: Getting the Brain to Pay Attention.” Also, click HERE for the webinar handout and HERE for the infographic that includes additional information not covered in the webinar. If you want to do one of the Follow-Ups to the webinar, click on the Pop Quiz Homework blog post and follow the instructions there. For public face-to-face workshops that cover the concepts/activities in both my brain science book and Training from the BACK of the Room, click on my website’s What’s New? or Training Events pages.